CARROLLTON, Texas, Oct. 11, 2017 – When windstorms with hail strike the Dallas area, Dallas Flat Glass Distributing manager and vice president Robert Varela knows there’s going to be some long days and nights ahead at the office. “Whenever we get these sudden storms with marble-sized hail, along with those high winds, I just know it’s going to be crazy busy as we get a flood of calls from glass contractors wanting to replace all those broken windows,” Varela said. The sudden and sustained increase in business could overwhelm other companies following such storms. But getting through those stacks of orders and delivering panes for commercial and residential glass products in the Dallas-Fort Worth metro area and beyond has gotten a little easier for Varela and the employees of Dallas Flat Glass Distributing in the past few years, thanks to its Kenworth T270s. 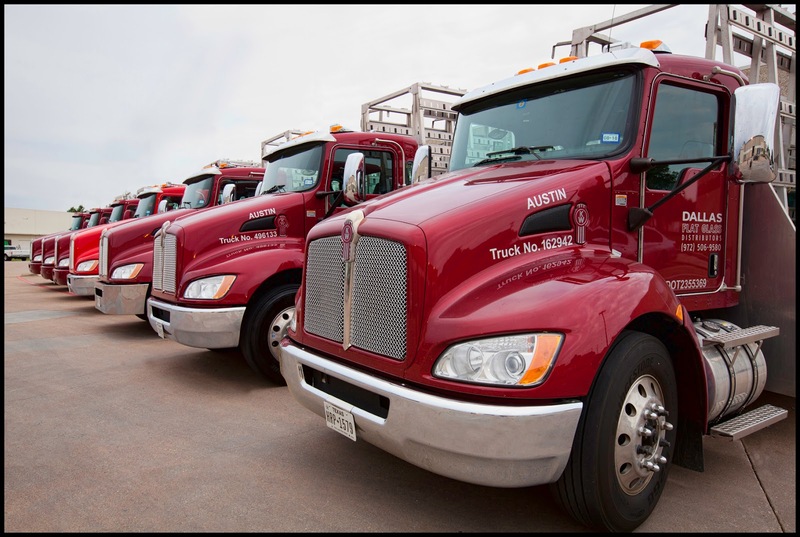 The Carrollton, Texas-based glass distributor started buying the Class 6 T270s from MHC Kenworth-Dallas in 2013 as part of a long-term plan to replace all of its distribution fleet of 13,000-pound Class 3 cargo trucks. The Kenworth T270s are equipped with six-speed Allison automatic transmissions and 350-hp PACCAR PX-9 engines providing 1,000 lb-ft of torque, and can carry nearly twice as much glass products on 24-foot racks, or 10 feet longer than the racks equipped on the trucks they replaced. Spec’d with two 56-gallon saddle fuel tanks, the T270s offer drivers a range of more than 750 miles before needing to be refueled. Founded in 2000 by Varela’s business partner, Tom Holman, Dallas Flat Glass operates a 100,000 square-foot warehouse in Carrollton. Each day, the glass wholesaler’s Dallas warehouse receives three truckloads of various types of glass in sheets. The sheets vary in sizes from 5-foot by 6-foot to 13-foot by 7-foot and, depending on the thickness of the glass, weigh anywhere from 2 to 3 tons each. At the company’s production facility, the sheet glass is cut to dimension and polished. 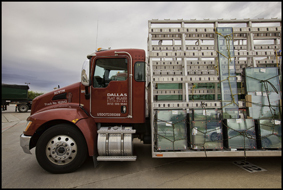 Dallas Flat Glass’s distribution fleet then delivers the finished wholesale glass to more than 700 glass companies within a 150-mile radius of the Carrollton warehouse. The panes are used to build finished commercial and residential flat glass products such as windows and doors for residences or businesses, large triple-pane energy-efficient panels for commercial buildings or large custom mirrored walls at store or mall entrances. Dallas Flat Glass also makes several finished products including frameless shower enclosures and all-glass entrance and handrail systems. The improved driver productivity delivered by the T270s and the dealer support from MHC Kenworth-Dallas means Dallas Flat Glass can respond more rapidly to those sudden surges in business, Varela said. The improved productivity has resulted in reduced employee overtime while the company still maintains an average annual business growth of 17 percent, he added. Varela finds that the company’s drivers are also happier driving the Kenworth T270s because they provide a more comfortable ride and the power needed to haul heavier loads. This all sounds familiar to Varela because starting in 1997, Varela bought and drove a used 1995 Kenworth T600 equipped with a 14-liter inline 6-cylinder engine and manual transmission, hauling dirt and rock products. 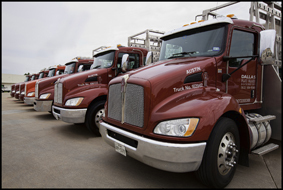 With the performance and comfort it offered, Varela said he developed a strong affinity for Kenworth. “When Tom (Holman) and I started the glass distribution company in 2000, Tom knew that I would at some point want to start buying Kenworth trucks for our drivers,” Varela said. For the first dozen years, Varela said their company didn’t have any dedicated salespeople. “While our business grew from our reputation of working hard and providing quality products, when we hired a dedicated sales team, that’s when our sales really took off,” he said. With the additional business that sales team brought in, Varela said replacing the older and smaller trucks with the larger T270s became a priority.